CIS PhD Welcome day (London, 21 February 2019) as part of the CIS PhD Programme. Yonsei University and QMUL workshop on Audio and Visual Learning for Multimedia Perception and Production, London, UK, 28 January 2019. Intelligent Sensing Summer School, London, UK, 29-30 August 2018. CIS PhD Welcome day (London, 8 February 2018) as part of the CIS PhD Programme. Intelligent Sensing Summer School, London, UK, 7-9 September 2017. Sensing and Privacy Workshop, London, UK, 20 June 2017. CIS PhD Welcome day (London, 9 February 2017) as part of the CIS PhD Programme. Intelligent Sensing Summer School, London, UK, 15-16 September 2016. The CIS Spring Camp is a three-week training programme in Intelligent Sensing held in London, UK, on 11-29 April 2015. The programme is composed of lectures, hands-on sessions, individual and group activities, competitions, and sports activities. CIS PhD Welcome day (London, 3 December 2015) as part of the CIS PhD Programme. Intelligent Sensing Summer School for Interactive and Cognitive Environments, London, UK, 31 August - 1 September 2015. The Centre for Intelligent Sensing is at the EECS Research Showcase 2015 that takes place on Wednesday 22nd of April 2015 in the Octagon of the Queen's Building at Queen Mary University of London. The CIS Accelerator Programme 2014 provides training, funding and mentoring to bring your research ideas and results to the next level. Intelligent Sensing Summer School, London, UK, 26-28 August 2014. The Centre for Intelligent Sensing is at the EECS Research Showcase 2014 that takes place on Thursday 3rd of April 2014 in the Octagon of the Queen's Building at Queen Mary University of London. 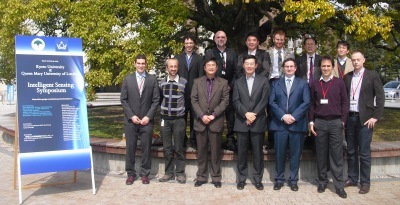 The Centre for Intelligent Sensing welcomed Professor Tatsuya Kawahara, Professor Takashi Matsuyama, Professor Toyoaki Nishida and Dr Xuefeng Liang, visiting academics from Kyoto University, Japan. Intelligent Sensing Summer School, London, UK, 11-12 June 2013.